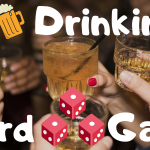 Board games offer the perfect opportunity to spend quality time with family and friends. I remember many hours spent sitting on the living room floor with my mom, playing game after game, until we couldn’t stay awake any longer. Learn strategy, build cities, delve into new worlds, and embark upon quests, all while in the comfort of your own home. Check out Game Cows picks for the perfect educational/family board games to enjoy with your children and loved ones any day of the week. Roll the dice and choose your strategy: Will you attack your enemies? Heal your wounds? Improve your Monster? Stomp your path to victory! 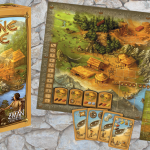 In Incan Gold, explorers push their luck while exploring an old Incan temple in search of gold and treasure. In each round, you decide whether to delve deeper into the temple, adding to your riches, or escape with the share you’ve acquired so far. Do you remember playing Candy Land when you were a kid? Introduce new generations to this sweet kids’ board game. Players encounter all kinds of “delicious” surprises as they move their cute gingerbread man pawn around the path in a race to the castle. Play a card from your hand, and place a chip on a corresponding space on the game board. When you have five in a row, it’s a Sequence. Score the required number of five-card sequences before your opponents to win. Azul was designed by the world famous, award-winning game author Michael Riesling. Azul captures the beautiful aesthetics of Moorish art in a contemporary board game. Players compete as artisans decorating the walls of the Royal Palace of Dvora. In Labyrinth, Ravensburger’s hugely popular board game for kids and adults, you can gain the advantage over the other players by inserting the extra tile to move walls and open passages of the Labyrinth. Experience the riches of the Renaissance in Splendor, a fast, elegant, and intuitive game in which players vie for control of gem mines, trade routes, and storefronts to master the gem trade and attract the attention of nobles. Players take on the role of Lords seeking new lands to expand their kingdom. As with ‘Dominoes’, these new lands must match the landscape tiles that have already been played. CHICKAPIG is a highly social strategic board game where Chicken-Pig hybrids attempt to reach their goals while dodging opponents, hay bales, and an ever-menacing pooping cow. More than just trivia, Wit’s End is a game of brain teasers and riddles in diverse categories. Shadows in the Forest is a semi-cooperative board game where one player takes control of a light and searches through the forest. Dare to search for the golden city! Assemble your expedition and lead it through the jungles of South America in this deck-building board game. You need to have a good plan, expert explorers, and the right equipment. A clever spin on traditional the traditional Monopoly board game. A fun way to celebrate the holidays with family and friends. Do you have what it takes to join the pantheon of winners? Build like a mortal and win like a God in the game of Santorini! This is a great game if you have family coming in to town. It can accomodate up to 8 players. In Codenames there will be 2 teams (blue and red). In which players will have to find all of their spies hidden on the board before the other team. There will be 1 player on each team that knows all of the code names of their spies, and they will need to guide other players to choose the right cards to reveal their spies. This is a great game for larger groups of players and encourages players to talk to each other. 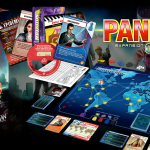 There is no hidden traitor or person singled out as the bad guy and is a fantastic social game for all ages. 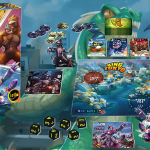 King of Tokyo is a battle royale where everyone will pick a giant monster and fight to control Tokyo. It’s a perfect outlet for young children who have the need to destroy everything without any of the mess. It has lighthearted cartoon artwork and over the top abilities that are suitable for young children. • Space penguin included in the box! Incan Gold is a press-your-luck card game where you will become an intrepid adventurer delving into the Incan temple in search of treasures. The game is very simple and easy to learn, so you can be playing within a few minutes of opening the box. The cardboard tents that come with the game to hide your score are also a really fun touch to the game. It’s easy to learn, quick setup, and a ton of fun. Once Upon a Time is an amazing game for families. It is a shared storytelling game where players will take turns making up and telling a fairy tale using cards that prompt events. If the player currently telling the story gets stuck, starts to ramble, or mentions a card another player is holding, their turn ends and another player will pick up where the story left off. Everyone is trying to use all the cards in their hand, and steer the story to their hidden ending. The game oozes creativity and is so much fun to play especially with young children. 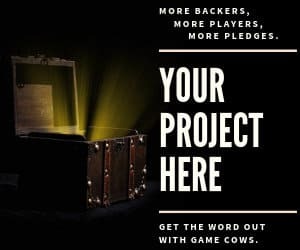 By the end of the game, everyone will have added and helped to create a unique story that usually has everyone giggling by the end of the game. In Survive! Escape from Atlantis, unsurprisingly, you will be trying to survive and escape from Atlantis. Players will need to evacuate their survivors to the safe islands surrounding Atlantis before it is completely destroyed and sinks into the sea. Players can either travel by boat or in more desperate actions try and swim, but they’re also sharks and sea monsters patrolling the waters. Survive! Escape from Atlantis can be a very competitive game. The components are all adorable, but it’ll be small consolation when your little people are eaten… but they are really cute. An absolute classic. Candy Land is one of the first board games that many of us play as kids and there’s a reason for that. It’s silly and whimsical, and perfect your younger children. It’s a great way to get kids interested in board games and a lovely way to spend tend with kids on Christmas morning, preferably with some Christmas sweets. If you’ve never played Catan, you are missing out. The simple idea of building roads and settlements can get very competitive and has been a household staple for my family for many years. After my very first game, I was so hooked, that I spent the next 3 days playing it nonstop with family and friends. For me, it’s one of the ultimate family games. The origins of Catan are even family oriented. The designer Klaus Teuber developed it with his family and would have his sons playtest the game, and I think his own words describe it best. Ticket to Ride has won several awards since it first debuted. It’s a Euro game which means it has a strong emphasis on strategy and usually focuses on non-violent themes. Don’t let the theme fool you. The game has a lot of depth and a surprising amount of strategy for a game that consists of building train routes. Ticket to Ride is a great game for younger and older players alike. Sequence is an abstract strategy game that plays like an advanced version of Connect 4 (or 5 in Sequence’s case). Players will play a card from their hand to place a token on the board in an attempt to make a Sequence (5 in a row). Jacks are wild and can either put a token anywhere on the board or remove a token anywhere depending upon the card. It sounds simple, but the addition of wildcards makes the game very competitive and fun. I’ve had many hours of fun with Sequence, and it’s one of the games that also works very well with 2 players. Azul is a very simple game to learn but incredibly difficult to master. You’ll be choosing and discarding tiles and lining them up on your board to earn points, but it’s so much more. The strategy involved in which tiles to choose and how to place your tiles and in what order create immense complexity and multiple strategies to play. The first few rounds will be easy and straightforward, but as you continue with the game you’ll realize how difficult it will become forcing you to think strategically. Quite simply, it is a fantastic strategy game that will have every player thinking and trying to come up with tactics. It’s excellent for older players and those that delight in challenges and puzzles. I have been playing Ravensburger games ever since I was a little girl. They make excellent children’s games, and Labyrinth is one that I still play today. Each player will be dealt a number of cards with an image of something inside the labyrinth, and they will have to push tiles to rearrange the board to allow their token a clear path to the picture on the card. Excellent for young kids and helps to build problem solving and spatial skills. Splendor is a very fun game where players will become wealthy merchants during the Renaissance. You’ll build up your trade network of jewel mines, artisans, and transportation to gain victory points, and gain the notice of high ranking nobles. Splendor is beautifully designed and comes with solid components that look and feel great. It’s a very easy game to learn, and I’ve been able to teach it to all ages. It has simple mechanics, but is very fun for adults and children alike. Dragonwood is a lighthearted dice and card game with very cute and silly artwork. Players will try to capture monster and enhancement cards to score points and special abilities. To capture cards they will play either multiples of the same card ( 2, 2, 2), a sequence of cards ( 1, 2, 3), or cards of the same color. For each card they play, they will get dice to roll to attempt to capture the card. Once captured they’ll give the player a special ability or victory points. The game is that simple, but so much fun. The artwork is very cute and suitable for all ages. If you read this short paragraph then you basically know how to play the game, it’s that easy. • Roll dice against your foes! Kingdomino is a very simple game that you can learn in about 5 minutes. It’s a kingdom-building game using dominoes. Players will take turns choosing dominoes to build around their own personal castle by matching up the domino tiles. It’s very quick to jump in and a ton of fun. It is very family friendly, and players will be building their own little kingdom, so there’s no blocking or attacking. Players will be alternating who gets to choose their tiles first, which gives the game a very family friendly feeling. A Strategic Board Game Where Chicken-Pig Hybrids Attempt to Reach Their Goal While Dodging Opponents, Hay Bales, and an Ever-Menacing Pooping Cow. Chickapig is absolutely adorable. Think of it as an alternative to learning chess. Some of the same strategies and skills needed in chess are used in Chickapig, but it’s a much friendlier introduction, and far less intimidating. There is no shortage of strategy here, though, and can keep you thinking and playing for hours. If you have family members that aren’t fans of trivia, you might want to try Wits End. It has a similar setup to games like Trivial Pursuit, but instead of trivia questions, you’ll get mini puzzles and brain teasers. I’m personally terrible at trivia (unless it’s Lord of the Rings trivia) but I always enjoy a good riddle. Wit’s End is great for a fun challenge, and there’s even an edition for younger children as well. This is probably best played on Christmas Eve instead of Christmas morning, primarily because you actually have to play this game in the dark. Shadows in the Forest is a semi-cooperative board game where one player takes control of a light and searches through the forest. The rest of the players will take control of ‘Nightlings’ that need to hide in the shadows cast by the light. It’s a very cute and lighthearted game, and I’ve never seen any other game make use of light in such a creative way. The Quest for El Dorado is a combination of simple deck-builder with a simple racing game. It’s a great intro game for players that have never experienced any of these mechanics. Players will be drafting and deck of cards that are used for movement or to purchase more cards. The closer you get to the city of El Dorado the stronger the cards you will need to push through the jungle. The Quest for El Dorado is a great game for all ages and has been nominated for several awards. It’s very simple to learn and offers a fun racing game, but can also be highly competitive, depending upon the players. I really enjoy the themed versions of Monopoly, especially the ones published by Late For the Sky. They do an amazing job on the board and themes, and I always choose the little reindeer piece. It plays like standard Monopoly with a festive theme. If Monopoly isn’t your thing check out our article delving deep into what makes Monopoly tick, and then maybe give it another try. Santorini is incredibly simple to learn and play, and that’s by design. Mathematician Gordan Hamilton designed the game to be easy enough that it could be learned and played by an elementary student and strategy-heavy enough to keep any level of gamer entertained. It has simple mechanics of city-building, but with added player powers and special abilities, the different ways to play keep everyone and not just young children in engaged. We hope you enjoyed this list. I’ve always loved playing games with my family, and hope you can make some wonderful memories this year. I chose games on this list that would be easy to pick up and play, weren’t overly rule-heavy, and had a good mix of accessibility and complexity in strategy. If you have any favorites or just want to talk board games I would love to hear from you.